rec. 2013, International Arts Campus deSingel, Antwerp; Bijloke Studios Belgium. 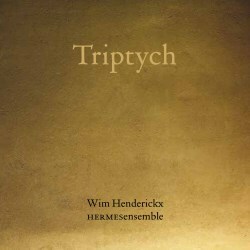 Following on from Disappearing in Light, Wim Henderickx and the HERMESensemble bring another programme of powerful contemporary sounds from Belgium. The Sanskrit phrase Nada Brahma literally means 'God in Sound', and this work is the third part of Henderickx's Tantric Cycle. There is a significant vocal part in this work, but you can search for the printed text in vain. This is "an abstract text construction that is devoid of semantic reference", following the essence of 'sound' in the meaning of the title. The impression is of a language one feels should be comprehensible, but absolute abstraction is maintained and we are freed from straining to associate words and music. The booklet refers to algorithmic procedures in the composition of this work, but this is anything but mathematical sounding. Genuine and disturbing beauty can emerge from violence elsewhere in sublime movements such as the third, Sacred Noise, and last, Cosmic Silence, and there is a deep lyricism in the stunningly eloquent but gently expressive New Spirituality. Ritual drumming is a feature, but this can also have a syncopated swing as in Cosmic Pulsations. The only problem with removing semantic meaning from the words is that we are left wondering what all the crashing and banging of something like Cosmic Chord is all about. On the Road, as its title suggests, was inspired by Jack Kerouac's novel of the same name. Originally for trumpet and electronics, the piece has been adapted for other instruments, and this version with the gloamy tones of the bass flute has a haunting, other-world quality. The electronics in this case form a "smooth carpet of sound" on a single note over which the flute plays in improvisatory, oriental style. The title Atlantic Wall refers to the Western European coastline that is "scattered with war architecture that sternly overlooks the Atlantic Ocean." This is a work that "explores the concepts of sound, resonance and voice, as well as the underlying natural forces of water and fire." There is a weighty power and some elemental violence in the work, but it also has a profoundly introspective quality in its expression of the effects of war, wanting to "sublimate the profound pain of human beings into an almost ritual experience." The piece has a subtitle, Voix de l'Ombre or 'Voice of the Shadow', and this comes across in the most darkly chilling and strikingly beautiful moments of Part I: Blue that spreads a jaw-dropping, shimmering curtain of sound. Part II: Red has a more oriental feel in its timbres and in its inscrutable sense of drama. The pulse is disjointed, melodic shapes are chopped and served slow, but the contrasts of electronic and instrumental/vocal sounds retains a unique fascination. The final Epilogue is a rare and surreal sonic bath of subtle strangeness, the voice and a clarinet turning through a dark-hued vastness. This is not your standard fare even by contemporary music standards. Some sections are harder to assimilate than others, but the best of the music here can affect you like the most powerful of poetry, striking deep and nestling in with your soul for the rest of time. If you are up for the spiritual challenge and a shot of eternal enrichment, then try Triptych.